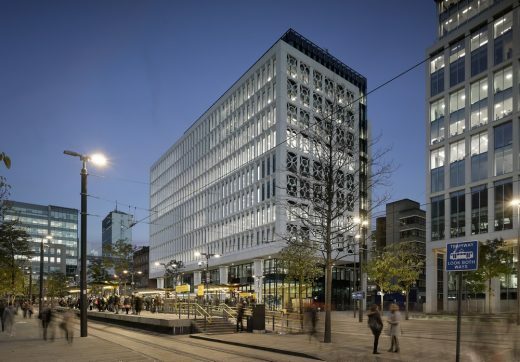 SimpsonHaugh has completed Two St Peter’s Square, a landmark commercial office development at the heart of Manchester’s newlyregenerated Civic Quarter, which delivers 200,000ft2 of high quality, speculative office space. 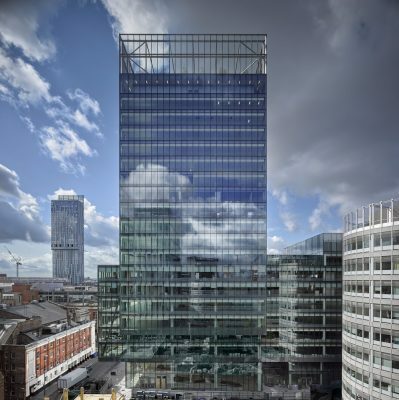 Designed for Mosley Street Ventures Limited, three floors of the 12-storey building have already been pre-let to Ernst and Young (EY), one of the largest professional services firms in the world. The building is owned by Deutsche Asset & Wealth Management who acquired the site in 2015. 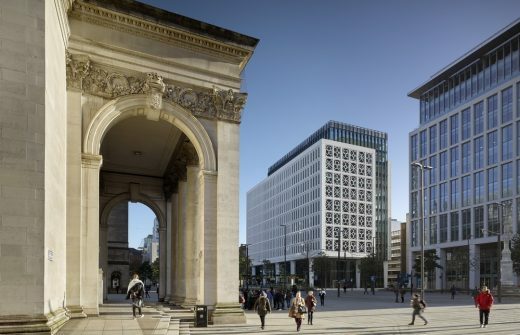 Two St. Peter’s Square is the final component in the seven year rejuvenation of St Peter’s Square, which SimpsonHaugh masterplanned in 2010 as part of Manchester’s Civic Quarter Regeneration Framework. 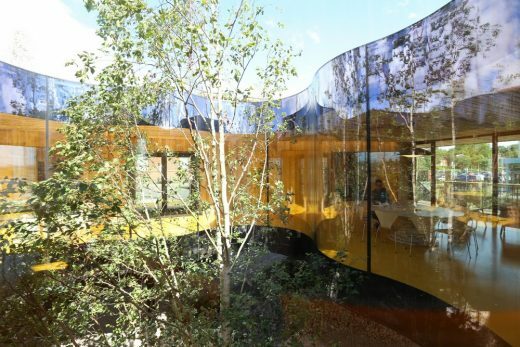 The practice was also involved in both the renovation of the Town Hall Extension opposite Two St Peter’s Square and the RIBA Award-winning Library Walk link building connecting the Town Hall Extension to the City Library. The new building anchors the corner of the square with a design that provides a powerful and formal civic presence. Patterned tracery screens, inspired by motifs embedded within the adjacent Town Hall buildings, are formed of 6×4-metre prefabricated reconstituted Portland Stone panels, each weighing approximately eight tonnes. The intricacy of the motifs pushed the material to its limits and has created a unique precast façade. 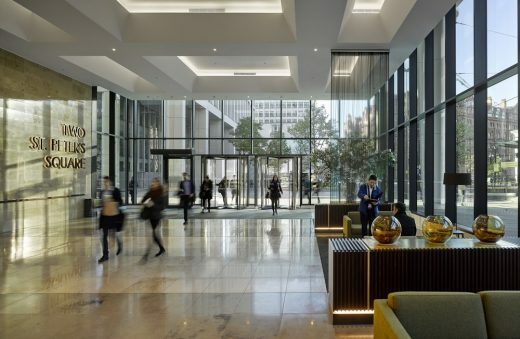 Internally, just three internal columns punctuate the floorplate and by positioning the core at the back of the building, SimpsonHaugh achieved unusually large clear spans of up to 18metres to aid flexibility of use. 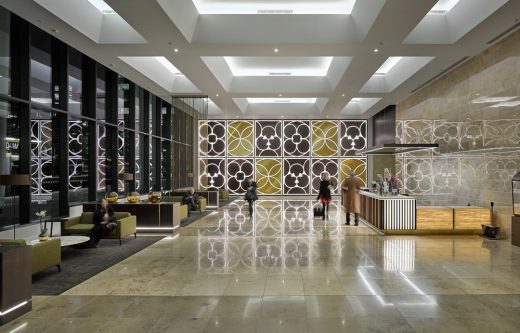 Generous 2.9m floor-to-ceiling heights underline the superior quality of the space, which is designed to Grade A specification using high quality natural materials such as stone, hard wood and bronze in the reception and lobby areas. 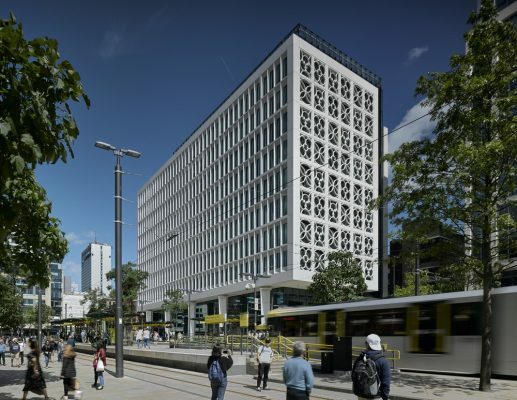 Two St Peter’s Square achieved a BREEAM Excellent rating and is intended to set a new benchmark for high quality office developments in Manchester. 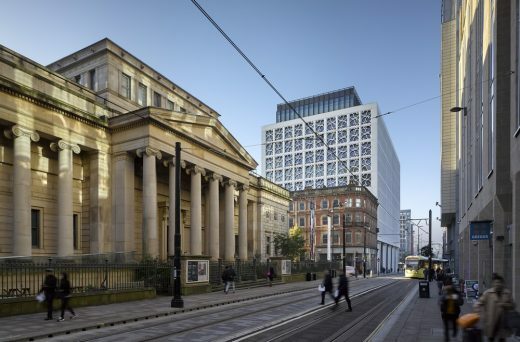 The project was managed by Swithenbank Property Consultants on behalf of Mosley Street Ventures Ltd. 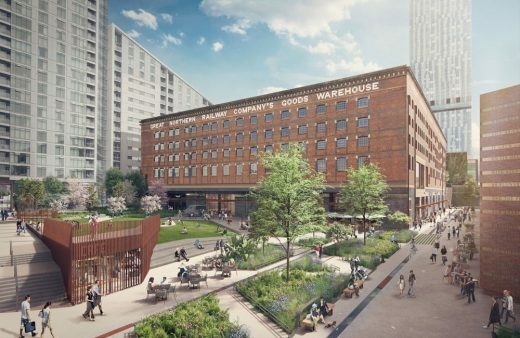 The new office development replaces a group of four-storey buildings and reinforces St Peter’s Square’s status as a major civic space, following the relocation and expansion of the Metrolink Second City Crossing tram stop and the creation of a new landscape. Sir Richard Leese, Leader of Manchester City Council, said: “St. Peter’s Square has been transformed in to a much loved space, successfully marrying key transport services and public realm. Originally known as St. Peter’s Field, the Square was built on the southern edge of Manchester in the late 18th Century and soon became the focus of the town’s intellectual and cultural activity. In 1907 St. Peter’s Church was demolished and the Central Library and Town Hall Extension built from 1934-1938. The extensive renovations to the Square and its historic buildings combined with the completion of Two St. Peter’s Square will become an important milestone in the Square’s history.